So you’ve implemented a Genesys solution how do you get the best out of it? You need a powerful and feature rich desktop application. ICE sits between your Genesys environment and business systems and exchanges the knowledge captured during the handling of a phone, chat, e-mail or task interaction with the other systems within your business. With ICE you can expect to shorten interaction handling times, avoid double-entry of data, provide full customer transaction records and minimise clicks and keystrokes. Your users are expected to work with your business systems and handle customer interactions that may arrive by phone, e-mail, chat or other media. 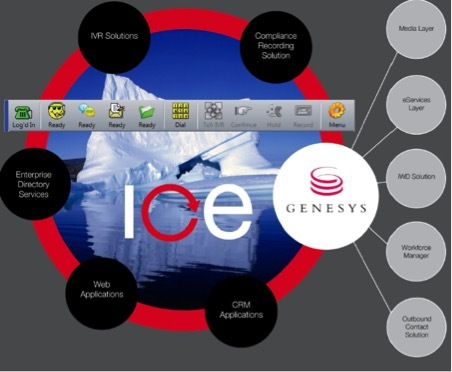 ICE brings the Genesys environment together with your existing business systems so users can handle customer interactions in a complete and seamless manner. ICE is installed on over 5,000 Contact Centre and back office seats today. Users love the bright colourful way it keeps them aware of their status, the way they can customise the user interface to meet their personal preferences and the minimal intrusion it has on their Windows work space. Adaptability is ICE’s key strength. Now you can have a single client application which can be deployed to all users within your organisation who are handling one or more of the Genesys interaction types. It’s no longer necessary to administer multiple desktop solutions within your organisation. ICE’s Plug-in architecture ensures only the things that need to be customised have to be customised. This keeps the cost down and the implementation time short. A Plug-in contains any customer specific functionality required. At minimum a Plug-in contains the conversation screens displayed when a new phone call, task, chat request or e-mail is presented to a user. It may also contain that functionality that interacts with your CRM or business applications. ICE drives increased levels of agent schedule adherence by presenting users with a regularly updated view of their Genesys Workforce Manager schedule. Workforce planners can change agent schedules at any time and be confident users will be alerted to an imminent schedule change.